Day 1: Sandy Argentine Beaches: You embark from Puerto Madryn in the afternoon, your prow aimed for the Falkland Islands. Golfo Nuevo is renowned for its visiting southern right whales, so you have a good chance of spotting one as you sail toward the open ocean. Day 2 - 3: Sea Life, Sea Birds: Though you’re now at sea, there’s rarely a lonesome moment here: Several species of bird follow the vessel southeast, such as albatrosses, storm petrels, shearwaters, and diving petrels. Day 4 - 8: Finding the Falklands: The Falkland (Islas Malvinas) Islands offer an abundance of wildlife, easily approachable – with caution. These islands are largely unknown gems, primarily remembered for the war between the UK and Argentina in 1982. Not only do various species of bird live here, but chances are great you’ll see both Peale’s dolphins and Commerson’s dolphins in the surrounding waters. Steeple Jason– Home to the world’s largest black-browed albatross colony (roughly 113,000), Steeple Jason is a wild and rarely visited island buffeted by the wind and waves. Weather and swell conditions dictate the journey here. West Point Island – Thick with black-browed albatrosses and rockhopper penguins. Volunteer Point – A large white-sand beach, somewhat exposed but with a large king penguin rookery and other plentiful birdlife. Port Stanley – The capital and seat of Falkland culture, Port Stanley has some South American traits mixed in with a little Victorian charm: colorful houses, well-tended gardens, and English-style pubs. You can see several century-old clipper ships in the surrounding area, silent witnesses to the hardships of 19th century sailors. The small but interesting museum is also worth a visit, covering the early days of the settlement up to the Falkland War. Approximately 2,100 people live in the capital, where you’re free to wander at will – though admission fees to local attractions are not included. Bleaker Island, Sandy Bay – Nearby Big Pond offers excellent wildlife opportunities, featuring the dark-faced ground-tyrant and Magellanic snipe. There’s also an easy walk to see gentoo penguins, Magellanic penguins, rockhopper penguins, and king cormorants. Sea Lion Island – Very exposed, so you need some luck to make a landing here. But if a stop is possible, it’s well worth the trip: This island is home to the largest breeding colony of southern elephant seals in the archipelago, with approximately 2,000 individuals on the northern beaches this time of year. A decent hike leads you to a southern sea lion haul-out. New Island, Coffin’s Harbour – This location is a reasonable walk from the landing site at the New Island South Wildlife Reserve, providing views of nesting black-browed albatrosses and rockhopper penguins. A more strenuous hike to Landsend Bluff may also show you some South American fur seals. 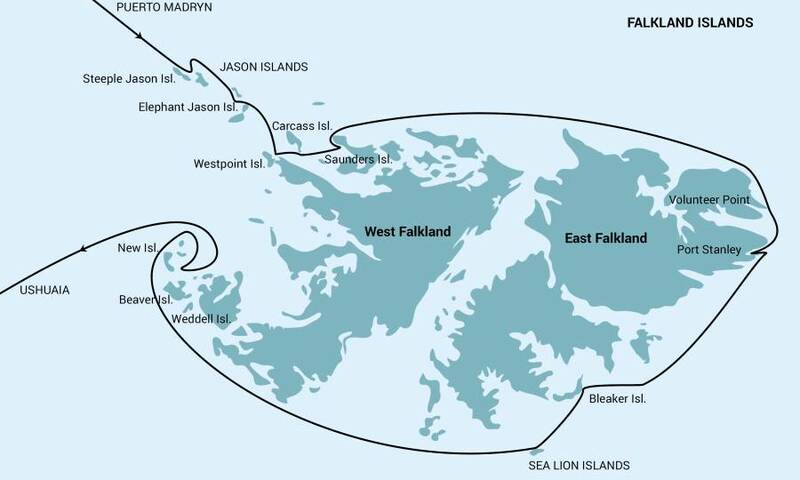 The site of the only land-based whaling station on the Falkland Islands is south of the landing beach. New Island North Nature Reserve – Landing here requires a special permit. If received, you can make a farewell visit to the black-browed albatrosses (among other bird species) and South American fur seals that make the Falklands their home. Day 9: Once More to the Sea: You’re westward bound, sea birds trailing you all the way to South America. Day 10: Southernmost City: In the morning, you arrive and disembark in Ushuaia. It is commonly held to be the world’s southernmost city, located on the Tierra del Fuego archipelago – nicknamed the “End of the World.” Even so, the memories you’ve made on this expedition will accompany you wherever your next adventure lies.